Kevin Pietersen – The Return of the Prodigal Son? The Return of the Prodigal Son is one of Dutch artist Rembrandt’s best-known work’s of art. Likewise, Kevin Pietersen is one of the best-known cricketers of recent years. And just like artwork, opinions can be divided. With the announcement this week that Kevin Pietersen is to return to domestic action for Surrey in the Natwest T20 Blast this summer, social media has been awash with comments from players and fans alike. There is little doubt that Pietersen thrives on being in the spotlight. A return to domestic action will certainly bring him the attention, if not the financial rewards available elsewhere. There is also the fact that he has a young family. Having spent a large part of the last winter playing for various overseas T20 franchises, it is easy to see the appeal of spending time sleeping in his own bed. When you consider he was widely expected to play in the Caribbean Premier League, the attraction of a short commute across London become more obvious. We doubt he will be relying on Southern trains though! 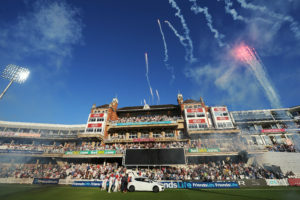 Cricket fans reacted with a mixed set of opinions, many still bitter about the perceived lack of commitment shown by Pietersen over recent years. Certainly, the connection with Surrey is probably based as much on convenience as cash, with the original decision to leave Hampshire some years ago seemingly precipitated by location and the limited benefit to the club at a time when he mostly played only for England. Much has changed though since Pietersen left Hampshire in 2010. The key change being the loss of his England contract. That translates into availability for a County side, most of whom suffer from their England stars being largely unavailable for the domestic season. That was certainly one of the reasons for Surrey engaging with Pietersen in the first instance. Surrey are a club that have always had and expected major success. A big player fits into that environment and plays well with the big-name sponsors around such a club. It is a fair bet that Kia Motors were happy with the increased media attention brought about by Pietersen’s arrival back in the latter stages of 2010. He will certainly bring the media and the fans to the Kia Oval in 2017. That has to be good for Kia and Surrey too. What Does It Mean For Surrey Players? One point that has been overlooked somewhat is the impact of Pietersen on the Surrey squad. Much of the commentary has been on the risk of demoralising a relatively young squad who may feel Pietersen’s arrival blocks their chances to play. That overlooks the question of how Surrey have managed his arrival with the team and what they felt he delivered when he last played for them a few years ago. It is perhaps worth reflecting that Surrey have quite a few players who mould themselves in a similar style, seeking to play aggressive entertaining cricket. And they have become increasingly successful in doing so over the last couple of years. Back in division one of the County Championship; beaten finalists in the Royal London One Day Cup in 2015 and 2016; numerous players representing England at senior and junior levels. This is a Surrey team on the up. Alec Stewart is a man who knows more about Surrey County Cricket Club than most people. He has said there are 3 things Pietersen will bring to the team this year: ‘experience, quality and entertainment‘. Entertainment is all about bums on seats and financial success – the club needs that. Experience and quality are what he brings to the team. A few years ago, when Pietersen first signed at Surrey, we heard Jason Roy asked about his arrival. His response was along the lines of ‘who wouldn’t want the chance to learn from somebody with his level of talent?’. If Surrey can manage their players and achieve an outcome where Pietersen genuinely does help develop their younger players, it could prove a very shrewd signing. The Return of the Prodigal Son could be said to be one of Rembrandt’s most successful pieces of work. The signing of Pietersen by Surrey may also prove to be a long term success. Sign-up now - don't miss the first ball!